Disabled help Tenerife. 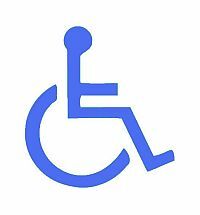 There are many services from which the disabled visitor to the island may benefit. I should perhaps begin by giving you details on the organisations that provide much helpful assistance. These are companies that were operating when I lived in Tenerife and, indeed, I had a mate who worked for them. They're still going strong now. They provide all sorts of services for disabled people - airport transfers, wheelchair hire, mobility scooter hire and even have their own bus for disabled friendly excusions! You can call them on the (cheap rate) UK number 0844 5983 555. Operating for 20 years, this German-run company offers all the usual services - wheelchair hire, scooter hire, airport transfers. They also offer professional nursing care. Found on Avenida Amsterdam in Los Cristianos. On my last few visits to Tenerife, I'd noticed, quite frequently, a small van parked up in Los Cristianos, just near Alison's apartment. The writing on the side said it was Paul Goldney Services, providing wheelchair hire. As Paul is an old mate of mine (who used to perform the "Not The Real Elvis" show - see my Entertainers page), I thought I'd better give him a mention here. He provides wheelchair hire, plus many other aids for the disabled, such as zimmer frames and crutches. He can also arrange some wheelchair-friendly accommodation. The truth is, Tenerife is not that well adapted for wheelchair users (although the area of Las Americas and Los Cristianos has won awards for accessibility), but there are a few hotels I can tell you about. Ditto the comment for hotels, but there are some complexes that are fully wheelchair friendly, plus some that have ground-floor apartments accessible by ramps. Although there are many bars and restaurants where there are no stairs involved at the entrance, there are a few that are fully wheelchair friendly and cater for disabled people. I'll be adding details eventually. There is one great beach I can tell you about. Found between Playa de Las Americas and Los Cristianos, Playa Las Vistas features a ramp down to the beach, plus wooden wheelchair friendly paths leading along the sand. There is even a chair available for borrowing that has wheels with caterpillar tracks, to enable you to go right down to the water - or even further! There are staff standing by, too, to offer assistance, should you require it. The beach also boasts disabled changing rooms, showers and toilets. Best of all...it's all free! Despite the fact that the Tenerife bus service, TITSA, is normally an excellent service, it doesn't appear to run any buses with wheelchair access. LeRo, the company mentioned above, also hire out hand-controlled motor vehicles. Avis Car Rental are currently adding hand-controlled cars to their various fleets, but I'm not sure if this innovation will have reached Tenerife yet. There is an Avis desk in the south airport, so you could ask them.